If you live in Wake Forest and own a home or a business, Peak Pressure Washing is here for your commercial and residential power washing or pressure washing needs. We use a low pressure power washing system that is eco friendly and can keep the exterior of your home or business free from dirt, mildew, mold and other grime. 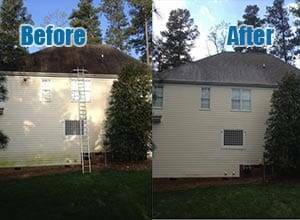 Because the exterior of your home or business is the first thing that people notice, our Wake Forest pressure washing service can help you make a good first impression, no matter what the season. Because we use a low pressure power washing system, we don’t damage your home or paint job when we clean. Contact us or call us at 919-796-9026 and get your free estimate for pressure washing in Wake Forest today. Your roof, on your home or business in Wake Forest, is exposed to the elements throughout the year. This means it is susceptible to stains from pollen, algae, leaves, and other dirt and grime. 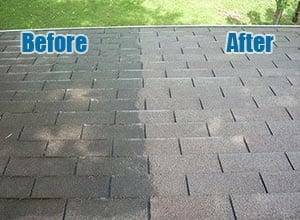 Peak Pressure washing offers their low pressure power washing services to clean your roof and remove any stubborn stains that leave your roof looking unsightly. We guarantee that our low pressure roof cleaning services in Wake Forest will remove the much without damaging your shingles, tiles, or the rest of the roof. 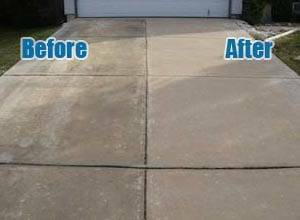 High traffic areas on your property, such as your driveway and walkways, that are usually made of concrete or stone masonry, are likely to suffer from staining because of oil rust, gas, or other dirt. Because they are high traffic, they may stain and get dirtier than the other outdoor areas of your home or business. Peak Pressure Washing can help restore the natural beauty of your masonry or concrete areas. We use a low pressure power washing system for concrete areas in Wake Forest NC to have your driveways, walkways and patios looking new in no time. We spend a lot of our outdoor time on our decks and patios, but these spaces can get dirty making them less relaxing and more stressful. 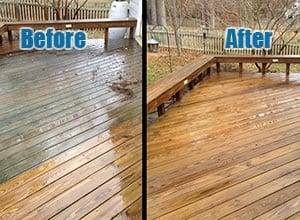 Fortunately, Peak Pressure Washing in Wake Forest offers low pressure deck & patio cleaning that cleans your deck or patio without damaging them. Our team will remove mold, algae, pollen, and other sources of deck or patio stains, so you can enjoy your outdoor home areas year round. 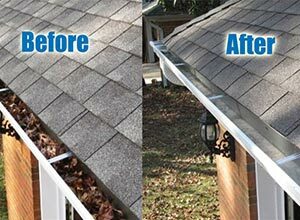 If you need gutter cleaning in Wake Forest for your home or business, Peak Pressure Washing can help. Your gutters can become dirty or even clogged because of falling leaves, branches or other debris and dirt, which means they may not drain properly. Moreover, this dirt and grime can leave them looking unsightly. Peak Pressure Washing provides low pressure gutter cleaning in Wake Forest to keep your gutters unclogged and looking good. Peak Pressure Washing provides high quality, but low pressure, commercial power washing in Wake Forest NC. We know that each business has different power washing and pressure washing needs and we aim to keep the outside of your business looking beautiful with our commercial power washing in Wake Forest NC. 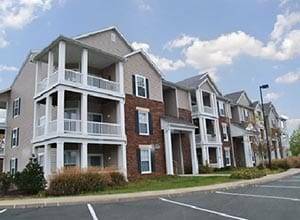 If you are an HOA, apartment complex, gas station, office park or other property manager for a business in Wake Forest, we would love the chance to earn your business. Let us give you a free estimate for our commercial awning & signage cleaning, concrete pressure washing, commercial gutter cleaning or other commercial power washing need. Contact us online or call us at 919-796-9026 today. Are you interested in one of the Wake Forest Pressure Washing Services we offer? Get in touch with us via the form and we’ll get back in touch with you as soon as possible. Remember the name “Peak Pressure Washing” for all of your low pressure power washing in Wake Forest. Peak Pressure Washing is your source for residential & commercial low pressure power washing services. We proudly offer our cleaning, pressure washing & power washing services in Wake Forest, Raleigh, Cary, Apex, Holly Springs, Fuquay Varina, Clayton, Durham, Garner, Morrisville, Knightdale, & beyond.